The race today was a test of my STRENGTH. 13.1 miles is an amazing distance. Factor in Rain, small race field, no spectators, LONG straightaways, and it was not a day for a PR. I truly thought if I did not get my PR I would be upset.... I am so PROUD of the outcome.. TRULY TRULY proud. I gave it all I had and left every ounce of energy I had on the course. Full details tomorrow.. Thanks to EVERYONE for the amazing support and Good Luck Wishes!! 1. I can't FOCUS. Muscle Man and I were chatting about 2010 race plans. He is toying with running his first Half Marathon!! I am so excited I could barely focus on work all day. I just kept thinking about what race, which training plan he should use, how we will work babysitting so we can run together, getting him new shoes, etc..
2. I have an enormous Zit near my right eyebrow. I hope it does not show up in any of my race pictures. Seriously this thing could have it's own zip code. I wonder if 90211 is taken? 3. I was a BAD Eater this week. Brownies 3 days in a row, and more than one helping on each day. Chicken Fingers and Onion Rings yesterday. Countless trips to the Candy Lady's cube in my Office. Today my Stomach is acting up....What could ever be the cause?? 4. I am secretly wishing that the High Five Friday Movement would spread and that I would show up on one of the lists. 5. My addiction to coffee is getting out of control. I used to have a Latte in the morning and be fine the rest of the day. Now I need a mid day jolt and have even fired up my coffee pot after dinner. **I took the photo at the top of this post on my Blackberry and I think it is AWESOME!! What you cant see in the picture is the WIND and drizzle, oh how I hope tomorrow morning the weather is PERFECT.. Which leads me to my last CONFESSION. These are my confessions.. If you have anything you need to get off your chest feel free to leave your CONFESSION in a comment. Tall Mom Family Halloween 2008..
Clark Kent, Wolverine, Lois Lane, and Super Baby. Wishing you all a Happy and Safe Halloween!! Cold run near work trying for race pace. The LAST RUN in my Half Marathon training plan is in the books. I have loosely followed the plan (skipped a few speed days oops) yesterday called for 30 minute Tempo Run, which I interpreted as 30 minutes getting my body comfortable with race pace. Thought I should wear my Halloween colored outfit... CHEESE!! It was COLD, I could see my breath the entire run. I opted to run along the road to avoid Garmin Gremlins, I wanted to know my pace. Kerrie and I realized that we work 1.3 miles away from each other, CRAZY, so I headed on a running tour to find her office. To sum up the run in one word... AWESOME!! 7:31, 7:30, 7:32, and 7:24 for an overall 7.29 pace!! Seriously I felt amazing and it was a huge boost for my confidence on race day. Granted it was 4 miles and I will have to add 9.1 at that pace...I feel STRONG and ready..
As I approach the last run I am officially registered for I can't help thinking about the MISTAKES that I have made in each of my runs during my SHORT running career (Can I call it a career?). Sooooo in an attempt to help other Rookies out there I will admit my MISTAKES and hopefully help you all from suffering the same Miss-steps. 1. Do not overdress.If you do overdress do not put your race number on the outer layer. 2. Don't Forget the Batteries!! In your Camera, Garmin, Ipod, etc. On Marathon day I brought our nice big camera, but alas the battery was plugged into the wall. 3. Use the Honey Bucket (Portable Toilet) as many times as you need to and be PATIENT in the line. 4. Do not let someone jockeying for position take you out of your run. Try to get away from anyone who takes away from the JOY of the race. 5. Do not go out too fast!!!! Trying to recover from a side ache is not fun. 6. Gu when you need to Gu. Have a nutrition and water plan in your mind which you have practiced. In a LONG race you can easily get disoriented and forget. 9. Do not let negative thoughts slow your stride. Have something to focus on that will make you smile. When Polly Pesimism comes to visit you will need a catch phrase to keep her away. Lately I have heard the words "Make it work" from Project runway in my head.. Mainly because the idea of TIm Gun Running makes me laugh. Can you imagine his outfit and perfect posture..
10. NEVER wear gear you have not run in to RACE... OK I have not done this one...but truly test your gear before you run even a 5K. Your clothing, gear and accessories can make all the difference. Hmmmm..Giraffe costume? We will see what I end up doing on Saturday. I want to keep the hat on as long as I can. ***I know none of these are not Yoda inspired or life changing. I am NOT a research and post kind of gal, I am a MOM who has time to post what I know. And what I know comes from experiences. Please don't make the same MISTAKES!! and send me SPEEDY vibes I am going to need it to cut nearly a minute off the pace that my legs like to run.. I love Julia's topic for TIART today...will be posting my 3 Wishes soon. I have been an athlete since grade 6 (subtract the few years I took off to pop out babies and eat ice cream.) As an Athlete I am highly competitive, driven and focused. Running is VERY new to me, I find the challenge really exciting. I have yet to truly unleash, leave it all on the course and collapse with an empty tank. This weekend I am going to do that in my Half Marathon. I may end up crawling to finish the last .1...but I would rather that then having an excess of energy that I did not exert. My goals...have been ever changing. Following the lead of the amazing Marlene and making it my own I have 4 distinct Goals...using the classifications from my Work yearly Evaluation. I believe that this is possible on a perfect running day. My only hesitation is that I have not been 100% committed to my speed work or my training plan. In order to hit this pace I will have to stay focused and not let Polly Pessimism in at the first sign of fatigue. I will be uncomfortable at this pace, but I know I can do it. Winning the Costume Contest would also Far Exceed my expectations. Beating my current Half Marathon PR by over 2 minutes would be AMAZING. I know my legs can run sub 8 minute miles for 13.1 miles. It is my head that needs to be in it to pull this off. I would be SUPER happy with this time. This would be a 1 second PR. The Capital City Half Marathon, my first and only Half Marathon, was a Rolling Hills course and I had never raced before. I did not know what to expect and was just running to see what I could do. I know I can beat my PR and I expect to beat it by at least 1 second. 8:33 is my comfortable, I could run all day, Pace. If I have a BAD running day (for me) and opt to just Finish and enjoy the race this will be my time. I will still be proud, but my GOAL is to beat my PR not just to Finish. So there you have it. Still have not tested out my Giraffe hat from Tangle Wit Designs. I am NERVOUS to run in a new outfit on Race day, I do not want any wardrobe malfunctions. I have a few options laid out on my dresser, including a plan for UGH Rain. On the plan today 30 minute Tempo run....I plan to run for 30 minutes as fast as I can...for FUN!! Then 2 days of rest before the BIG DAY!! Last week was a GREAT running week. Muscle man joined me 3 times. Ran 4 miles with my co-worker I call Zen Runner and a guy in our building..pretty sure they will be great fill ins when Shelby is busy. 5 mile run in the 7's pace on a WET day...not fast enough to avoid the rain drops. To cap it all I had an AMAZING long Run on Sunday. It was a BEAUTIFUL crisp sunny day. While the Little Studs were on a nature walk to the Park with Grandma Mimi and the Uncles, Muscle Man and I got on our gear for a quick 3 miler. This outfit is comfortable in any temperature. Brooks EZT, Moeben Sleeves, Newbalance tights, Balega socks and Brooks Trance 9 shoes. I scored hubby a Brooks outfit at the local Outlet.. Think I need to get him some new running shoes for Christmas, looking at his shoes gives me anxiety.. This is the start of a little path into the park.. Oh how I wish the photo would capture the beauty. I was in runner HEAVEN. I want to push pause and have the leaves stay just as they are. When I am outside I feel like I am in an Autumn painting. After the run we went to another little park and snapped a Fall family photo.. Little Stud #2 does not like having his photo taken. 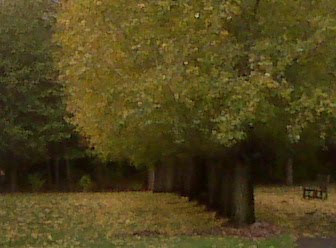 The instant I saw these trees lined up I had to get it on film. WOW!! The older the trees, the more amazing they become. And for fun I slid with the kiddos on a slide shaped like an aunt hill AWESOME.. Cool morning run in the neighborhood, hit every SLOW stop light. I was nervous about postponing my Long Run to Sunday and playing 2 hours of Volleyball that night....but Saturday was FULL so I made due. The morning of my run I discovered a new pre-run food. Smores Oatmeal....yes folks Oats with chocolate chips and little marshmallows all melted together.. YUMMY!! Have no idea of the nutritional content, I will never pretend to be a Food expert, EVER. It is easiest to sum up my long runs bullet point style because I tend to RAMBLE, I know you are surprised. The Stop Lights were ANNOYING.. I hit every one at the wrong moment. I am not a fan of starting and stopping.. UGH! I have been teaching Little Stud #1 not to say "Hate," and replace it with the words "That is not my favorite." So Hills continue to be not my favorite. Slowest mile was all hill. My arch in my left foot was my only pain, it lasted for .5 mile around mile 9. Felt like I stepped on one of the kids Lego's...OUCH!! I generally see minimum of 8-12 runners. On this run I saw only 3. Runner #1 was a fit woman with bright white hat and gloves, all I could think about was how dirty her gear would be after one running season. Runner #2 was a smiley mid sized man wearing a football team beanie and unmatched clothes. Runner #3 was a pocket sized lady with a huge head of hair in an over sized hooded sweatshirt. My race plan is to take a Gu Chomp at miles 4 and 8 and a Gu Roctane at 6 and 10. The last 3.1 I should be fine, but I will pack an extra chomp just in case. I HOPE HOPE HOPE that I feel as good this Saturday for my race, I had energy to spare....which is good because I am hoping to trim some time. My comfortable pace is around 8:33....I want to run 7:33 in my Half Marathon... Hmmm is it possible? This week I will take it easy to prepare to RACE. Race Goals coming up. Don't Forget to enter the Brooks for Her Giveaway HERE. I am sooooo behind on my Blogging.. Going out of town for a day and pushing long run to Sunday makes it TOUGH.. Full Running Blog tomorrow, going all the way back to last Wednesday...UGH.. Will include some awesome Fall pictures from Wilsonville, Oregon yesterday. Here is a HINT.. OK a really really obvious hint. Once I had the idea of a Giraffe I perused the Internet for ideas and came across the most amazing and ADORABLE Giraffe hat made with love by Kristina at Tangle Wit Designs. Monsters 'n' Animals and Princesses Oh My! Unique Polar Fleece Hats handmade for you by a skilled designer and artisan! So many to choose from... come take a peek! Giraffe, Unicorn, Monsters, Husky, Doggy, Horse, Polar Bear and many more. Check out her Websites below...you won't be disappointed. This lady is not only a talented Artist, she decorates her packages and she runs.. Look at the cute newspaper clipping she taped to the package..
And the NOTE on the package. This arrived and Totally made my day. THANK YOU Kristina!! I will be back next year for sure!! After I had the top done I found some printable fabric and designed the Image above...nothing too fancy but you get the idea. My WONDERFUL Mom played seem stress sewing on the decal and putting together the Giraffe print items to complete the ensemble.. and here you have it.. I am not a scary Halloween person, so I chose a cutesy costume. I am not sure if I will be able to run in the whole costume...so I have real running clothes in mind to change in and out of. Can I still win the Costume Contest if I don't run in it?? I am going to take my hat for a SHORT test run tomorrow.. imagine the looks I will get around the cul de sac...yes people it takes effort to reach my level of awesome (dork). FYI I have been RUNNING..and running a lot...realized I have not posted about any of my runs this week.. OOPS!! This week Muscles Man joined me for 3 runs!! Today we visited Wilsonville, Oregon.... New home to the in-laws. Hubby and I went for a quick 3 miler... Loved it.. Fall pictures coming soon..
LONG run got pushed to tomorrow... Wish me luck. Last LONG run before my Halloween Half Next weekend. Speaking of that my Costume is almost complete. Thanks again Mom and to the LOVELY lady who sent me an AMAZING topper to the ansemble!!! I will be giving all you lovely readers a preview of my complete and utter dorkiness, Umm I mean creativity!! My AWESOME Mom Mari- For buying us goodies at Trader Joes, sewing my Halloween Race costume to 95% done (no way I could have done what she did) and (Dad too) for offering to babysit the Little Studs next Friday night so that Muscle Man and I can go to the Race. Jennifer- Racing at 22.5 Weeks pregnant. This lady is TOUGH! Run Faster Mommy- Struggling with her baby boy turning 1. Amanda- Big announcement on her Blog this week, she is 8.5 Weeks prego with their first baby!! I have not had time to FIND Giveaways this week so please let me know if there are any great Giveaways I should add. First off I am soooo excited I won Socks on I Run Like a Girl.. I love to WIN Giveaways almost as much and I Love to Host Giveaways.. I will have a totally silly self-sponsored Giveaway tomorrow :) So check back. If your going to be at the Marine Corps Marathon, come by the Balega booth, ask for Carol, tell me you saw this on facebook, and I'll give you a FREE PAIR OF BALEGA SOCKS!!! The only catch is to tell me you saw it on facebook! See you there! 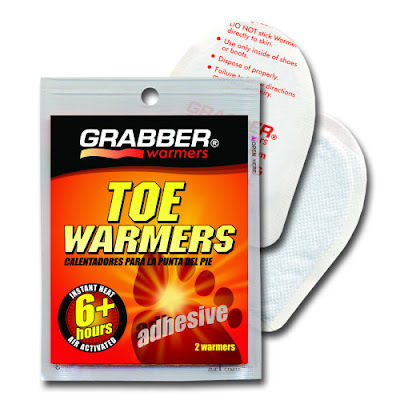 Any of you Running Marine Corps Marathon don't forget, Balega socks are AWESOME and Free is the best Price. You know what is funny?? Melody of I Run Like a Girl is Running in MCM...consider this me giving you socks right back... Gotta Love how life works..
as you make use of." 10 days to my next race and Halloween. 19 days until our Big Little Stud turns Four. 36 days until (American) Thanksgiving. 65 days until Christmas. 71 days to the end of the year. Time Time Time.. 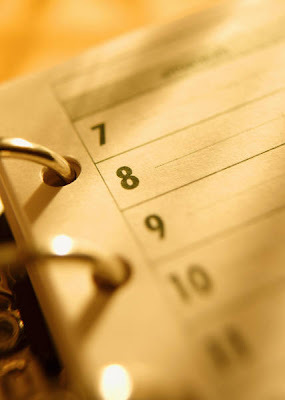 I find that I often live my life by the calendar...which is VERY VERY important for a Mom and career Woman. Last year I don't feel that I planned my Running Calendar very well. 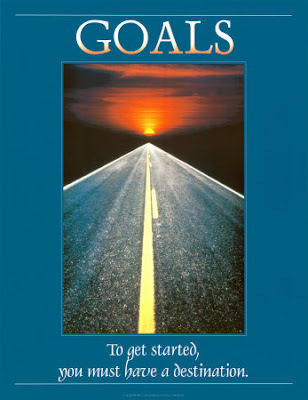 Looking ahead to my goals and plans for running in 2010 I want to be more strategic and as Tim Gun says "Make it work." So I am getting some HELP. I registered for the Bonneylake Fleet Feet Marathon training program which starts on January 9th!! The plan will help me prepare for a STRONG Marathon in late April or early May. But which one??? Hmmmmmm?? Off to check out the online running calendars. So how do you plan your racing year? Do you sign up for races well in advance? Do you run the same races every year? This will be my second official year running I am curious what you do... Input is valued and welcomed..
***Looking at the TALL MOM CALENDAR for this week I realized there are only 2 races on my list for High Five Friday this week. If you have a race this weekend (besides Shannon and Marlene) please let me know so I can pencil you in.. Or send me your racing schedule in a comment. I am pretty good at getting most of the races I know about...but a little help is always nice. The Little Studs LOVE the Movie CARS. They would watch it all day long, with brief breaks to race Lightning Mcqueen and Mater around the Island in the Kitchen. I added the CARS "Life is a Highway" Rascal Flatts version to my I-Pod Playlist. Always makes me smile and think of my Boys. Yesterday we went for a family run... YIPPEE!! This was Muscle Man's first effort since our 5K on September 19th. It was WONDERFUL!! I loved being with my family and not worrying about my time. We did our usual route and the Little Studs were amazing.. amazing because we woke the baby from his nap to put him in the stroller.. This is a photo taken hours before my LONG rainy run on Saturday. It is not the best because I was hanging out of the car. I LOVE LOVE these trees because they change colors at different rates. There will be a Yellow, Orange, Red and Green AMAZING!! But it only lasts for about a week.. I almost missed it, the first tree is about to lose the leaves. Another look at the Beauty that is Fall outdoors. The Little Studs all bundled up and ready to ride. The only thing I missed...Gloves...their tony hands were cold when we were done... Next time!! I found them!! The tights I have been dreaming of, I LOVE LOVE spandex!! I look like Spider Man or Cat Woman....total Super Hero. Thank you Sugoi. More details soon.. Top by Greenlayer. This is the new development for our usual 3 mile route. Notice the houses are SLOWLY being built. Soon I fear we will have to find an alternate route. Muscle Man Powering through!! Hey wait for me.... I am a little behind this week with my Weekly Giveaway and posting comments on your Blogs. I WILL get caught up....EVENTUALLY. Thanks to I Declare for sponsoring this Giveaway and thanks to all of you for leaving comments. I had hoped to have a new Giveaway ready for today....but I admit I am a little behind this week. So stay tuned. UPDATE: Just ran with Muscle Man and the Little Studs...oh how I love a good family run. Pictures tomorrow.. Since I have zero time to Blog I thought you might like the photos below.. These were taken exactly a year ago. I had one race (5K) in my adult life under my belt. I ran with co-workers to drop the baby weight. Funny how a year can change things.. The Little Studs have grown too.. We need to go back to this park it is the PERFECT place to take Fall photos. And on 10/18/08 I was BLESSED to be a Bridesmaid in Katie and Drew's Wedding. We were SPOILED with manicures, pedicures, hair, makeup, limo rides, amazing flowers and dresses. I felt like a princess, which was a GREAT confidence booster during my weight loss journey. Now 20 pounds lighter that dress does not fit at all.. HAPPY ANNIVERSARY to my buddies. I will be back to announce the winner tonight.. Welcome to new Tall Mom Bloggy pack members!! Thanks to ALL for your comments on my last post...I really want to be smart and not suffer an overuse injury. I also want to PR in my Halloween Half. I have decided to just go with my body, I know I am more than ready. Now it is just putting one foot in front of the other. I am soooo EXCITED for Bloggy buddies Britt and Jesse for their first Marathons...wonderful race reports for both. CONGRATS!! I am on pins and needles waiting to hear how Lacey did...UGH every Marathon should have the option to (stalk) track athletes. Afternoon run to try to beat the rain. Sore knees and a soaking wet last 2 miles. I had planned on doing a 15K self-race (was on my training plan last week). I took the first .5 at warm-up pace then planned to increase the speed. As I zoomed up the first incline I realized that I did not have the SPEED in my legs. So instead of stressing about my pace I planned to just RUN and incorporate some TOUGH hills. Here is the bullet point version of my LONG run. 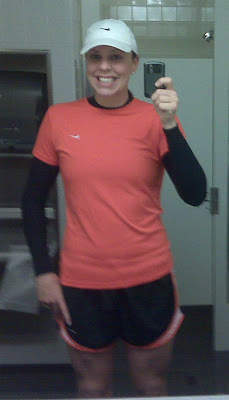 Dressed for the rain in my thick long sleeve jacket...I got HOT at mile 1. Should have run home and dropped off my jacket. I tied my jacket around my waist and it drove me CRAZY!! Must be sure to under-dress on race day. Smells: BBQ, Dryer exhaust, Wet leaves, car exhaust, and Burger King. The BRIGHT Red, orange and yellow leaves are soooo PRETTY!! I plan to get out with my camera before they are all gone. Made for an amazing setting to run. Felt light headed at mile 7.5, I did not bring water with me, but ate a Strawberry Gu Chomp and felt a little better. I need to wear my Nathan Fuel belt, I was thirsty the whole run. The RAIN started to pour at mile 8...funny all I could think was "I hope that I am channelling the rain so that Lacey and Robin can be DRY in their race tomorrow." LOL like I have any power over mother nature. I was GLAD that I still had my jacket because the rain made the temp DROP and it was COLD! The last 1.5 miles I kicked it up and was PROUD that I did not let my bad week and sore legs get the best of me. So there you have it, one more LONG run in the books. I am OFF to the craft store to put together my costume and to Fleet Feet for something SUPER EXCITING!! Happy Sunday! This week has been yucky, mucky and just no fun. I try to keep on my HAPPY face...but with the rain (only bad because I run on my lunch break and have to look professional), pain in my knees, and lack of energy I have to admit it...I have not liked running this week. When something is not good I want to make it better. One thing I know about myself is that I have the power to change how I think about things. Pondering and looking at my training plan I figured it out. My STUPID EGO is creating stress, which has caused the pain, and lack of energy (nothing I can do about the rain). I have the Hal Higdon Advanced training plan printed out and have TRIED to follow it, with little success. Why in the Monkey do I think I am Advanced? I have been running for just over a year and have 1, count it 1, Half Marathon under my belt. Pretty darn sure that an "Advanced" training plan is not geared toward the full-time working mom who runs on her lunch hour. It is the former-college-athlete self-esteem in me who believes that I can accomplish anything. My Ego needs a good kick in the booty..
Sooooo with 2 weeks to my Halloween Half I am going to re-assess and not put so much pressure on myself. I truly think that will fix what is broken...and send Polly Pessimism packing. AND I am sooooo excited I have the best idea for a COSTUME idea for my Halloween Half Marathon... a costume that is also great running gear.. I have a few pieces to put into place. You are going to LOVE IT!! I am thinking of announcing the I Declare Charms Giveaway winner Monday....if I can put together my next Giveaway by then. So make sure you enter!! I am soooo excited to be the host for Take it and Run Thursday at Runner's Lounge. Thanks to Amy and Tom for their creativity and opening their forum up for all of us!! The post will be up soon on Runner's Lounge...I did not get the video to Tom until late last night....SORRY TOM!! So here is my question I hope you ALL play along..
Scarecrow asked for a Brain, Tin Man for a Heart, and Lion for Courage. If you could meet the Wizard of Running and ask for anything what would it be? When your wish was granted how would your travels down the Yellow Brick Road of running be different? I would ask the Wizard of Running for PATIENCE. 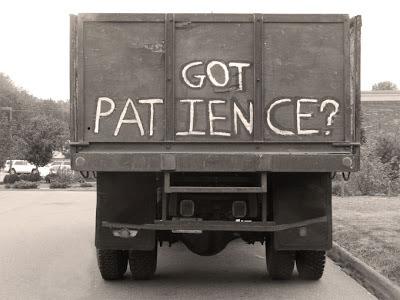 I believe that a dose of Patience would make me a better Runner, Mom, Spouse, Friend, Co-Worker, etc. etc. I always feel rushed and pressured. I want to be faster, stronger, better, run more races, achieve more things, skip ahead, more more more, now now now. PATIENCE!! Slow down! Enjoy the road. I truly believe that Patience would help me Enjoy the journey down the Yellow Brick Road of Running. I would be able to find the Zen that I seek and with time I would achieve my GOALS. I leave you with this DORKY video shot after my 14 mile run last weekend. The trail is actually called The Foothills Trail, not the Orting trail....sorry about that..I was not about to retake the video, people were already gawking wondering what I was up to. Turn down your volume, the road noise is bad. Running has changed my life for the better in so many ways. In order to feel good at the end of the day and set a positive example for the Little Studs I will FOLLOW the RULES :) That is not to say that I wont cheer loud and possibly hop in for a tiny tiny spell in a race... But full out Bandit, that is not my style.. 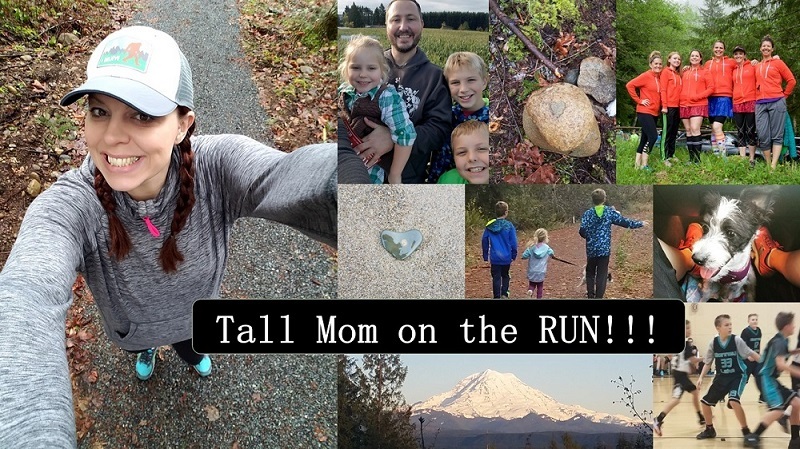 Tomorrow Tall Mom is the host for Take it and Run Thursday at Runner's Lounge. Please participate!! I think the question is pretty fun. The theme is set around a post I wrote a couple months back HERE.. This week FALL has hit me hard...the rain has truly messed with my training schedule. I am trying to see the SUN and be positive...I took the photo above at the Pumpkin patch on an AMAZING fall day. Here is wishing you a wonderful night and cool crisp days with no RAIN...or snow for some of you.. to enjoy the FALL running season.. I have read about runners being "Bandits" on a race course. For those who don't know the term, a "Bandit" is a runner who joins the racers and is not registered for the race. 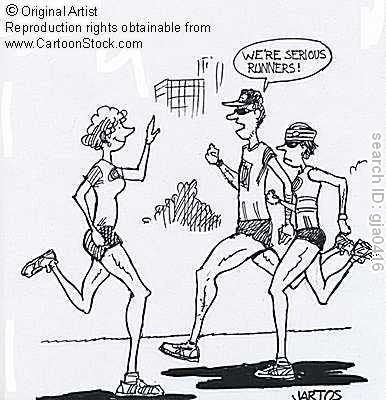 Often a runner will chose to be a Bandit in support of a fellow runner in order to help him/her in the pursuit of a PR. I must say I am tempted to be Bandit for an upcoming race....won't tell you which one or for who I would be helping. I am TORN. The Rule Follower in me is against it. The race fees are there for a reason, to cover the costs of the honey buckets, police support, medical personnel, aid and water stations, race numbers, athlete tracking, and all the WONDERFUL people who help put in road races. And what if something happened?? I am not registered and have not signed a release form for care. And worse what if I get caught and permanently banned from the run. 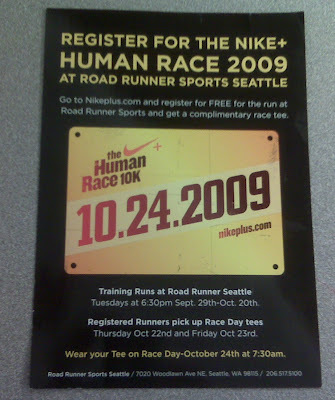 I should just fork out the HIGH fee and pin on my race number. The Penny Pincher in me is for it. I don't need to pay the money for the medal or t-shirt, I won't drink the water or take the Gu. I will start after the start line and leave before the Finish. I will be there simply to support a friend. Will use it as a training run for enjoyment. 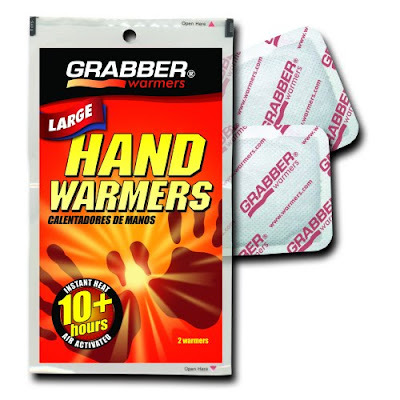 I should not have to pay if I do not use any of the amenities of the race...well maybe a Honey Bucket Stop or two. I could run most of the race and save the money. And if I like the course I will dish out the money next year. I have asked a couple people on received feedback. I also found an article HERE on Runner's lounge where the author wants to change the name from "Bandit" to "Leach," OUCH!! Several people commented on the article with opinions across the board on the issue. Now I am curious what you think?? Could Tall Mom be a Bandit? This AMAZING running top is made by Green Layer. Visit the website HERE. I first learned about Green Layer at my first Half Marathon when the race swag was an amazing Green Layer top. See my 14 miler post HERE for a picture. 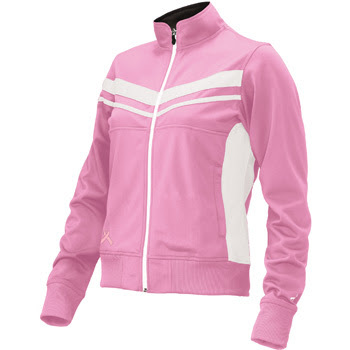 The fit and comfort of this Half-Zip is great for the Fall running season. I am a BIG fan of thumb holes, especially when I am wearing running gloves. And BONUS the Green Layer products are made out of recycled products. At just $39 this top won't break the bank. Shop HERE. Green layer also makes Men's products. Shop around, I know you will like what you see.. Yesterday I was TIRED...TUCKERED...TRASHED....hmmm could I possibly write this whole post using just "T" words?? I think not. I was in a MOOD and did not want to run. It is a Rare day when I don't feel like running. Thankfully I worked from home, the weather was nice and I had no GOOD REASON no to run..
Generally I am on the HUNT, intense and focused. Yesterday my Garmin was not charged (paperweight mode AGAIN), so I ran watch less and at a comfortable pace. It was the closest to smiley Zen running that I get..
My work-lunch-running-buddy Shelby left this on my desk. I know nothing about the "Human Race" but I intend to find out!! Thanks Shelbs.. I LOVE LOVE thoughtful people who think of others.. Speaking of wonderful people. 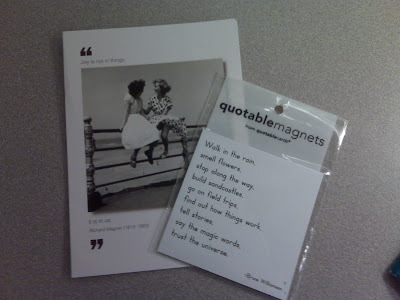 Lacey sent me the card and magnet above. How SWEET is that? Lacey will be running her FIRST Marathon this weekend.. and ran a 10K to pace her sister yesterday. So stop on over and leave her some Bloggy love! This morning I was in TERRIBLE, TREACHEROUS, TUMULTUOUS, TRAFFIC...but I told myself that I have no reason not to make this a TERRIFIC TUESDAY!!! Cool morning on the Orting trail, 8 miles with Amanda and 6 miles solo. Amanda adorable in photos and in person.. I should have taken a picture of the Orting town festival. When we finished our run there was a Pirate Parade going down the trail. I TOTALLY planned it.. Just kidding. There were vendors, a car show and people dressed in costume. Not the usual quiet trail. Amanda wins for the best self-portrait. My cousin's girlfriend, who is a Marathon runner, told me about a Marathon training program hosted by Fleet Feet. It is $100 and includes personal designed training plan, nutritional support, clinic sessions and group runs on the weekends. I can use my half price gift card to cover the cost. So it would be $50!!! Starts in January to prepare for the Tacoma Marathon the first weekend in June. I am considering signing up...Amanda is thinking about it too.. Will see. I KNOW we will run together again soon!! The rest of my run was BORING...I wanted to see if I could pick up the pace after having 8 miles on my legs.. Here are my post buddy stats, I took a quick break to change, say BYE and drop off my fuel belt. Other than the WEIRDO guy with no shirt on, the run was uneventful. I knew I would reward myself with a Smoothie after the run. Funny thing is the lady who helped me is a Marathon runner. She had just run Portland Marathon and said it was GREAT... Hmmm my in-laws just moved to Portland. Geeeezz this running thing is an addiction..
Congrats to ALL the runners this weekend. Beth, Morgan, and Carlee you ladies ROCK! !